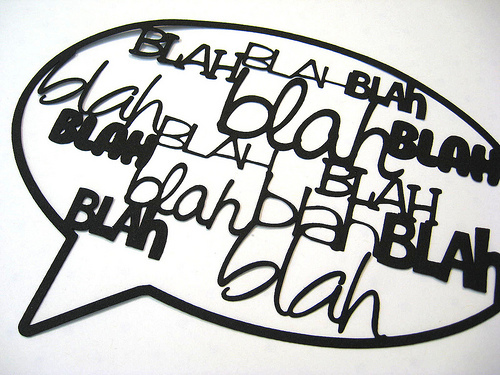 “Talk about it Tuesday” is a complete excuse for me to ramble. It’s actually 3.30am and I’m supposed to have gone to bed about 2 hours ago *whistling*… but I got sidetracked by some blogs, Amazon, JamieOliver.com (have I ever told you how much I love Jamie?) and then thought I’d better at least *attempt* to reply to some emails. All that stopped abruptly when I caught sight of my hair on my way to the bathroom. How can hair be both frizzy and flat at the same time? My hair seems to benefit from a salon blow dry. No, I mean REALLY benefit. The hair shaft lays flat and smooth, I get volume at the roots and some beautiful separation and swishiness to the ends. WHY THE HELL CAN’T I RECREATE A SALON BLOW DRY AT HOME? What is wrong with my spasmodic hands that stops me from being able to co-ordinate holding a brush and a hairdryer at the same time. I may aswell have flippers instead of fingers. I managed a 2:1 in Media & Cultural Studies (ok, admittedly… not *quite* rocket science), I totes bagged myself a freaking GENERAL anaesthetic during child birth and I can’t even remember the last time I washed up dishes by hand. What I’m saying is… I’m a resourceful kinda girl. So why is this simple act so completely out of my reach? Can you achieve a salon finish at home? Do you bother trying? Someone teach me the magic! Can’t do it myself. I think it’s impossible to do yourself, because you need to be able to see the back of your head and hold your arms at an uncomfortable angle forever to manage it. My hairdresser reckons you’re better off blow drying roughly, then setting the hair on big rollers for smoothness and root lift if you’re doing it at home. I settle for air-dried semi-dreads myself. It’s boho-chic. I can’t do it either. I recently bought a proper round brush and after watching the hairdressers do my hair I though I’d give it a go at home. My hair ended up looking fluffy and frizzy I also can’t use straighteners to curl my hair. We can… but it’s only because we have a sassy gay friend who’s willing to come over and do our hair. I have never, ever been able to blowdry my hair properly, but coincidentally I had a spending… episode in Boots last week. I picked up a hot air brush and it has changed my LIFE. Volume, no frizz, stays where it’s put. MAGIC. I can’t even to save my life. I do achieve a result that I like, though, if I use straighteners. Which I tend to do every day as a result, and that’s not very healthy for my hair, so I try to let it hair dry and embrace my natural waves regularly to give it a break. I can totally do a salon blowdry on SOMEONE ELSE but I can’t managed to do it on my own hair. Fortunately, my hair is very fine and doesn’t take much coaxing to become straight and smooth. I can’t do it either. I just blow dry it with running my fingers through my hair in an attempt to straighten it out a bit. Needless to say my hair usually looks crap. Especially on wet windy days. i’m a hairstylist and still can’t blowdry my own hair properly. i get frustrated after 5 minutes. it would help to have long hair though. also, never been through childbirth myself (yet..) but i’ve always said that if i’m lucky enough to have children, i’ll be asking for anything and everything they have in their medicine box and i’ll be asking it right after the very first contraction. so after reading this, you’re officially my idol. I was crap at blow drying before but the last few times I’ve been at the hairdressers I’ve really paid attention and now I can get something half decent although not as good as a stylist. I had my hairstylist show me how. He told me to purchase an Aveda round brush and put in some volumizing mousse. I use Redken “Full Frame” mousse. Flip your head upside down and blowdry it. When it’s 90% dry take the round brush to it and it turns out soo pretty. Add some pomade to control any frizz and a bit of hairspray. On the rare occasion I get my hair cut, I always watch carefully when they blowdry my hair to see if I can unlock their secret but so far nada. I end up with poofy (not in the good way) hair and a dead arm. Hope you can figure it out! I think that it’s down to the angle at which you hold the hairdryer relative to the hair. I can’t get a salon blowdry for the reasons identified by the other commenters. However, I do get a much better result if I hold the hairdryer by the barrel, rather than by the handle. I started this after I saw my hairdresser do it, and it’s much easier to control. i roughly dry my hair to about 80% dry. I then section it off and put the nozzle on and aim the dryer so the cuticle gets smooth. Once dry, I section again and straighten. I have thick hair so volume isn’t something I’m trying to achieve. It takes me 40 miniutes tops from start to finish. It’s a bit of mission but, It’s worth it. My hair is left smooth and bouncy with no excess volume at the roots. i LOVE jamie oliver, too bang bang good cookin. When you hair is damp, add volumising mousse or spray to the roots only – but nothing that leaves you hair feeling too tacky or sticky. I use KMS texture blast at the roots only. Then add a smoothing serum (I love love love Moroccanoil) into the mid-length to ends only (not near the roots). Tip your head upside down and blast to about 80-90% dry. Then (and this is important), section the top part of your hair into 2 sections and clip them, and leave the back out, but clip whatever hair you are not using away. Take a small section of hair, put your round brush underneath and let the hot air (need to use a directional nozzle on your dryer) blow down the length of the hair downwards. You need to make sure the air flow smoothes the cuticle down. If air blows up the cuticle it makes it frizzy – like a cat when it fluffs up its hair! 1. I let my hair naturally dry a bit, so that way I am not drying sopping wet hair. 2. I shelled out $$$ (I live in texas) for a nice hair dryer with a really narrow nozzle. 3. I section off my hair and blow dry from root to tip with the nozzle facing down and I use a nice round brush. 4. If I want a really nice blowout I will keep the ends on my round brush once they are dry, curl it up a bit towards my scalp and hold it for a couple seconds. Then I uncurl the brush and move on to the next section. This finishes off the ends so they look soft and not frizzy. I just repeat that all the way around section by section. It can be time consuming depending on texture and such, but it works nearly every time. I live in Houston which is pretty hot and humid for 1/2 the year, and this always works. I also like Aveda volumizing products, and Love the Shu Uemura hair products. They smell like white tea and are divine! Hope this works for you as well! I roughly dry my hair until it’s about 50-60% dry. And then I use Andrew Barton’s volumising barrel brush with my hair dryer and whilst I don’t acheive the gorgeous blow dry that salons can re-create, it does look half decent and has a lot of volume to it. I don’t know whether it’s the brush or products I use that creates the volume but both work great together. I wash my hair with Tresemmes 24 hr body shampoo, then apply the mousse from the same range and finish with the blow dry lotion from the same range. I also have their root spray but I don’t want to use too many products. Anyway, the Tresemme 24 hr Body range is wonderful so I’d recommend giving that a try. I can’t do a blow out either but I have found a few things that do help to keep the frizz down and add a bit of body. First off I use Joico Silk Result shampoo and conditioner, after a quick towel dry of my hair I normally keep it up in the towel while I finish my phase 1 bathroom routine (you know face moisturizer, brush teeth, contacts, etc). At the end of Phase 1 I towel dry again, brush my hair out with a wide tooth comb, sometimes I will add Moraccan Oil and maybe a volumizer like ThermaFuse Fixxe Volumizing Mousee, then section my hair into two parts, top and bottom. The top part, I run my fingers around my head from my eyebrows back, losely twist, bend the twist in half, tuck the ends, and clip. I do the same for the bottom half. The trick is to keep it loose, if you pull it tight the ends will have bounce but not the parts close to your head. My hair stays like this for about 20-30 min while I dress, make breakfast, pack lunch, make sure the teen gets out the door, and do my make-up. To finish I take the clips out, flip my damp hair, shake out, finger comb real quick, part, and go. Yes I leave with damp hair but my routine is long enough and I usually don’t have time to blow dry before work. When I do have time to blow dry I will unclip the bottom half, use my roller brush and blow dry down from root to tip with a slight curl under. My roller brush has a metal tube so that helps for my hair to get it dry and lets it run smoother through my hair. I only dry my hair about 60-80% of the way. After I complete the bottom half I loosely twist and clip as before. Then I flip my head down, unclip the top, and repeat the process, to include twisting and clipping it back up when done. My hair then sits like this while I put on jewelry and lipstick, bout 5 min. Then I unclip, shake out, finger style, part and go. Wheh that was a lot to type. Hope that helps, while it’s not an actual blow out it does give the hair a nice wave, bit of volume and bounce, plus a soft silky texture. Even if you skip the blow dry part, your hair might lay a bit flat after it dries but it will have some nice body and wave. My hair is fine but I have so much of it that it looks thick. I have also dubbed my hair Medusa cause despite being subjected to perming and color treatments it still appears and feels virgin. Most women would die for this however my hair hardly holds a curl or stays in a simple up do without a case of bobbypins and so much product it feels like concrete. And even after all that Medusa hair escapes and runs free. My strategy is to wrap my hair in a microfiber hair towel which absorbs a lot more moisture than a normal towel until I’m ready to dry my hair. So when I start, my hair isn’t wet, it’s just damp. I comb through my hair, then flip my head upside down and dry it until it’s like 90% dry (seems like a common theme) then flip my head back over, turn off the hair dryer, and re-comb my hair. Then I get the dryer out and my round brush (or a special brush I’m going to describe in a moment) and use that to lift my hair from the roots and pull down the shaft of the hair as I dry it. I have a special brush which has made a positive difference. Instead of round, it’s sort of oval, so it has two almost flat sides, and two curved like a small round-brush sides … and on 1/2 the brush it has the plastic bristles with little balls at the end, and on the other 1/2 of the brush it has boar bristles. This lets you switch quickly back and forth between using a plastic brush and a boar brush, and also lets you use it like a paddle brush or a round brush, which is really really handy. I go over everything with the plastic then with the boar bristles for smoothing. What I used to do which worked pretty well was to air dry my hair, and then to use a hot air brush just to smooth it out and add a bit of volume once it was all dry. I liked that because my hair’s contact with heat styling was minimal so it was good for natural healthy hair, and looked almost as good as if it had been blow dried. **1st Note – I don’t use mousse to start. I think it’s kind of gross and it doesn’t work for my thick hair that already has plenty of volume. I like light products like serums and creme-gels (Suave 365 is a great one) to start. **2nd Note – Sometimes, I finish drying just before my hair is completely dry (mostly towards the back of the head – front sections should always be completely dry) – for some reason, this prevents frizz on me although it sounds illogical. Stellar tips from all the ladies above me!!! I was gonna say the usual (heavy duty dryer, narrow nozzle used downwards, brush away from the head to give more volume at the root), but ended up learning a lot more!